Thanks to The Death of Hitler: The Final Word, we now know unequivocally that Adolf Hitler died in his Berlin bunker on April 30, 1945. Because you still weren't sure, were you? The conspiracies began to flow from the very beginning—the Soviets helped spread them. "Hitler has escaped!" reported the news agency TASS on May 2, 1945. Stalin later told U.S. envoy Harry Hopkins that he presumed Hitler and his henchmen Josef Goebbels and Martin Bormann were somewhere in hiding. Then there was that German submarine, U-530, that made its way to Argentina in July 1945. Who was on board? The History Channel series Hunting Hitler: The Final Evidence tackled this very subject. But as Brian Lowry put it in Variety, "if viewers were to take a shot of alcohol every time someone uses a phrase like, ‘There could have been … ‘ or, ‘There's a chance that Hitler might have come here … ‘ or, ‘If there was in fact a bunker …,' they would be plastered by the second or third commercial break." There was even an In Search Of episode devoted to Hitler's bride, Eva Braun: "My husband and I were traveling in the Himalayas when we came across a woman who we were convinced was Eva Braun" says one nameless woman. "I have seen her pictures, and I would know her anywhere." Well that settles that! In 2009 the History Channel ran a special called Hitler's Escape. Connecticut archaeologist Nick Bellantoni analyzed a purported fragment of Hitler's skull belonging to the Russians and concluded it wasn't his—rather, Bellantoni claimed it belonged to a female. The Russians, however, insisted the archaeologist did not have access to Hitler's skull. Bellantoni's findings were never published in any peer-reviewed academic journal, adding to the doubt. Which brings us to The Death of Hitler: The Final Word. The French journalist Jean-Christophe Brisard and Russian documentarian Lana Parshina were bent on closing the case for good. Following a months-long bureacratic process, the Russians finally relented and granted the authors limited access to the supposed piece of Hitler's skull and, even more crucial, a section of his teeth. As it turns out, the Führer had very bad teeth. 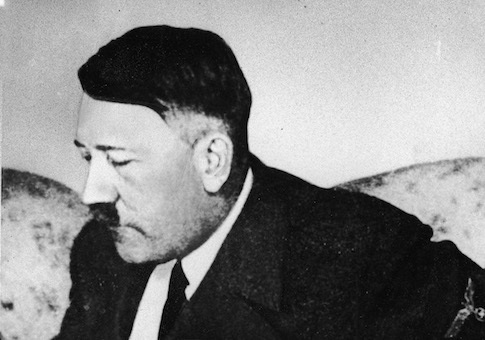 "Hitler suffered from severe dental problems," the authors write. Aside from all the cavities, "he was also subject to gingivitis and suffered from halitosis." His dentist Dr. Hugo Blaschke put in place multiple bridges but to no avail. By the end, Hitler was down to four good teeth. "He had shot himself in the mouth," William Shirer writes in The Rise and Fall of the Third Reich. This, however, seems unlikely since no traces of barium, lead, or antimony were found on the teeth (all of which would've been present from a fired bullet). And unlike Eva Braun, Hitler probably did not take cyanide or prussic acid—there were no signs of arsenic, mercury, or iron. Rather, Hitler is presumed to have shot himself in the temple, a theory bolstered by witnesses to the aftermath and mentioned in Ian Kershaw's definitive biography. But how Hitler died is less interesting than why all the rumors persisted. It was in Stalin's interest, the authors suggest, to spread the story of Hitler's escape. The very notion of a noncommunist country granting the dictator secret asylum was meant to undermine the West. But the Soviets also spent a considerable amount of energy promoting the idea that Hitler had indeed taken cyanide—the coward's way out. A handful of bunker survivors were subjected to imprisonment, torture, and interrogation by various Soviet ministries in order to extract the "truth" about Hitler's demise. When the interrogators did not get the right answer, they would simply repeat their questions—a process that went on for a decade. Germany, province of Brandenburg, near the town of Rathenow, forest to the east of the town of Rathenow, on the motorway from Rathenow to Stechow, just before the village of Neu Friedrichsdorf, 325 metres from the railway bridge, gap in the forest, from the stone post number 111—to the north-east as far as the stone marker bearing the same number 111—625 metres … The grave has been flattened out at ground level, and small seedlings have been planted on the surface forming number 111. The bodies were later reburied in Magdeburg and ultimately destroyed in 1970 as part of Operation Archive, under the supervision of future general secretary Yuri Andropov. The book isn't the easiest to read, considering it's a translation. And the authors generate enough drama to liken the investigation to The Da Vinci Code. It's not. But it does put to rest all the speculation about the end of one of history's most brutal dictators. The findings were also published in the European Journal of Internal Medicine. Yet something tells me The Death of Hitler: The Final Word will not be the final word. It'll probably be like Friday the 13th: The Final Chapter, which was followed by seven more Friday the 13th movies. It's never going to end.